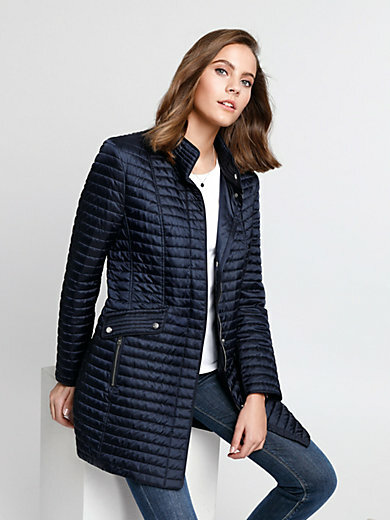 Long quilted jacket by BASLER. Fashionably narrow horizontal quilting and figure-flattering lengthwise dividing seams. This lightweight jacket with flat padding is ideal for spring and autumn. High-closing stand-up collar. Concealed zip fastening and push stud placket. 2 zipped side pockets with decorative straps. Inner pocket with zip. Outer material, padding and lining 100% polyester. Length approx. 34ins. The jacket is machine washable.